I am now living in New Zealand, but am always looking for anything that leads back to my own roots. I now a qualified counsellor, Martial arts instructor and am also back at post graduate study. I dont work in any of the areas or countries in that above selection. I'm in New Zealand, Specifically in Auckland. I am a counsellor and also do Advocacy when needed. I was born in Walvisbaai, and in the years following lived in Walvisbaai, South Africa and now New Zealand. (And that is a lot of travel to do when so young) I have settled happily in this area of the world but do miss the weather(I swear New Zealand can feel like the south pole its so cold here). I have, since leaving Walvisbaai, become a counsellor(I gradutaed from my degree last year) and have since returned to get my masters in the same qualification. 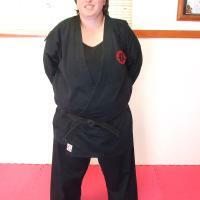 I am also a Bujutsu(Martial Arts)student and instructor with Fudoshin Ryu Bujutsu Inc. here in New Zealand.